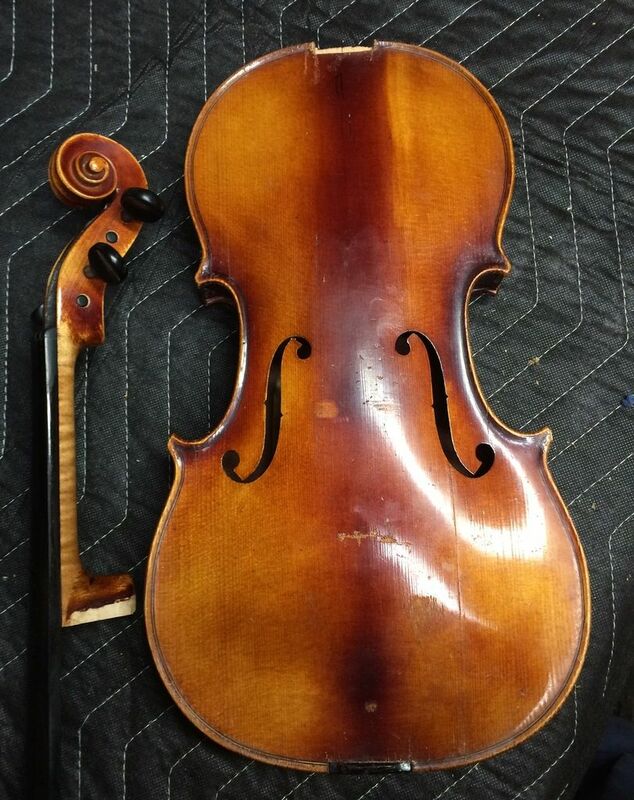 I had several repair projects over the last nine months…a couple of violins, two minor cello repairs, a classical guitar repair and a fairly major cello repair, from which I will eventually share a lot of photos. 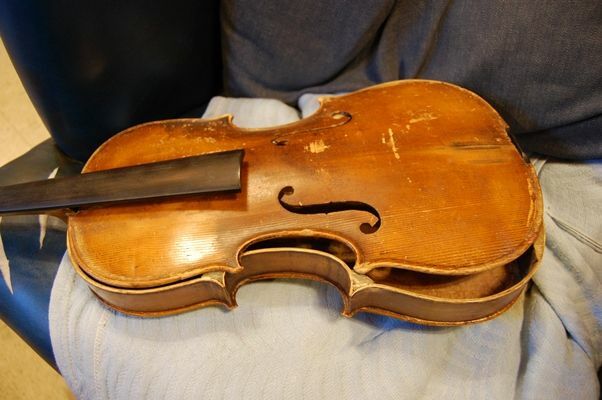 One of the violins was pretty pleasant, in that an 82-year-old man brought me his mother’s violin which he had never heard played, and asked me to restore it to playability. There wasn’t a great deal wrong with it, which was fortunate, as he was moving to another state that weekend. 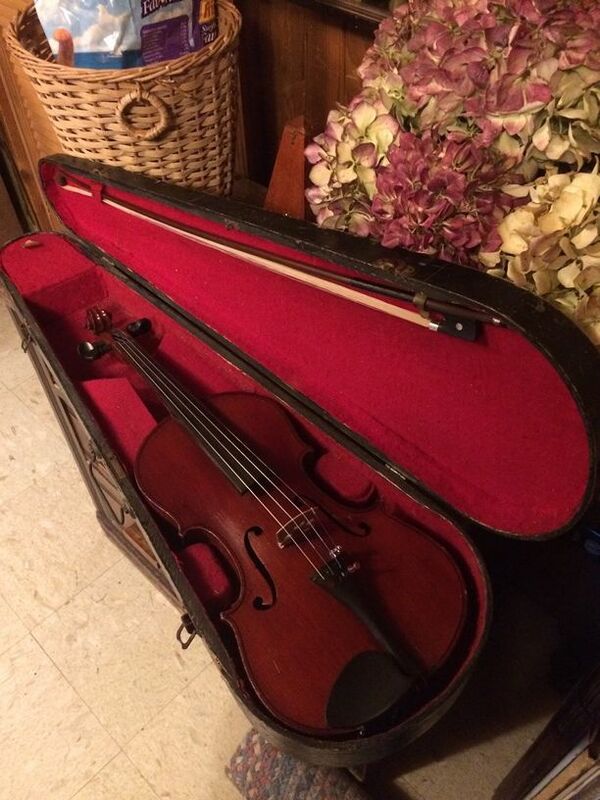 I was able to clean it up, hair the bow,make various minor repairs, and have it playable by that Saturday, and he met with me Sunday morning, and was overwhelmingly satisfied. 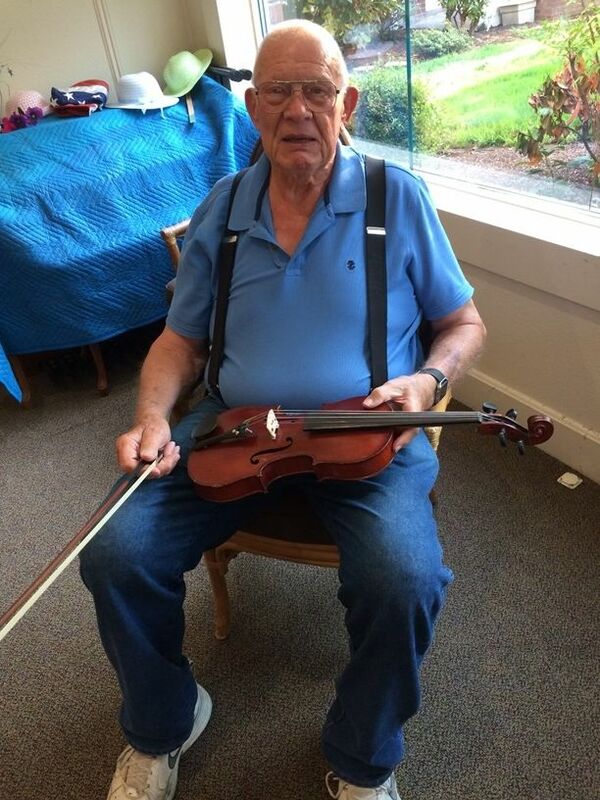 I played “Amazing grace” for him (very poorly– I truly am not a player), and he was pretty choked up. 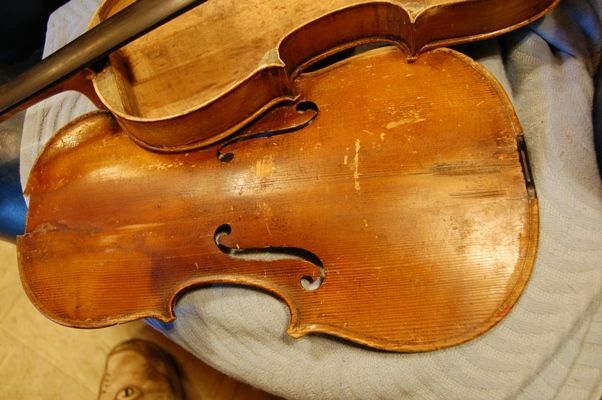 Another repair was an elderly plywood cello owned by a friend. It had open seams, a missing bridge, and a few other things. Pretty easy stuff, though. 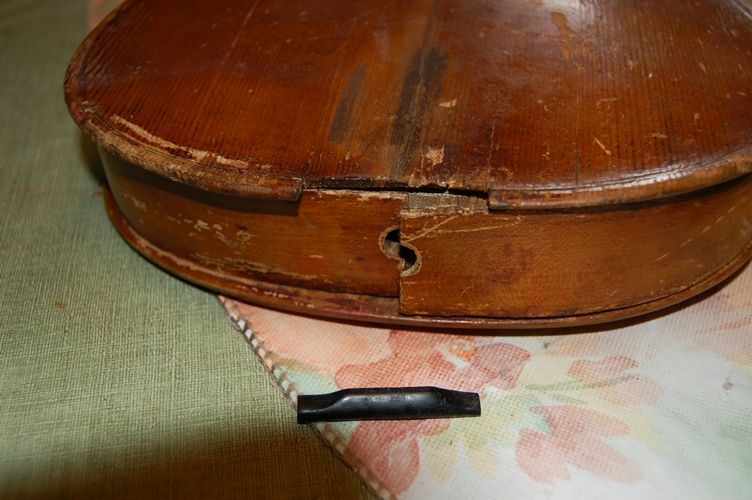 Her husband’s classical guitar (also plywood) also had open seams, and very bad old strings, so I glued up the seams, replaced the strings and took both instruments back to them the next week. 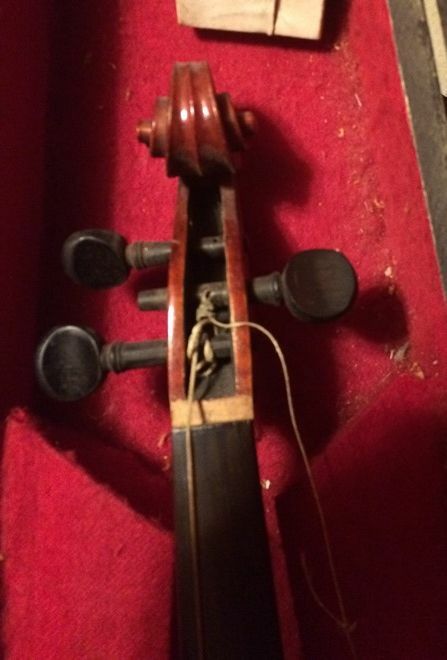 My son’s friend brought me her cello, inherited from her grandmother. 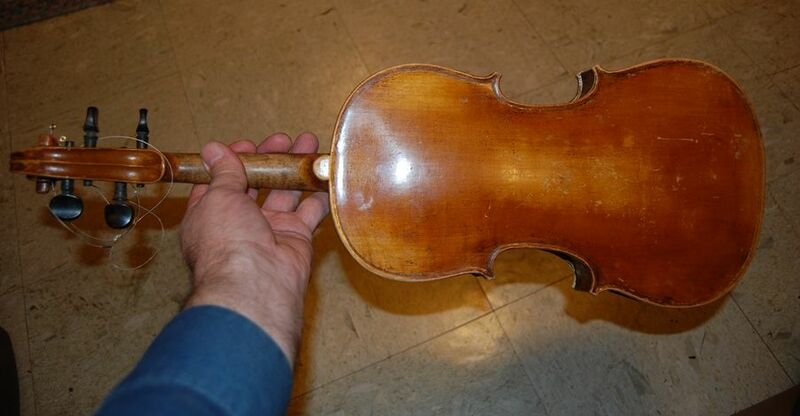 It was a nice, old Mittenwald carved cello, and she had been told there was a lot wrong with it. I looked it over very carefully, trying to find the things that were so “wrong”, but there was nothing… It seemed to only be missing the bridge. 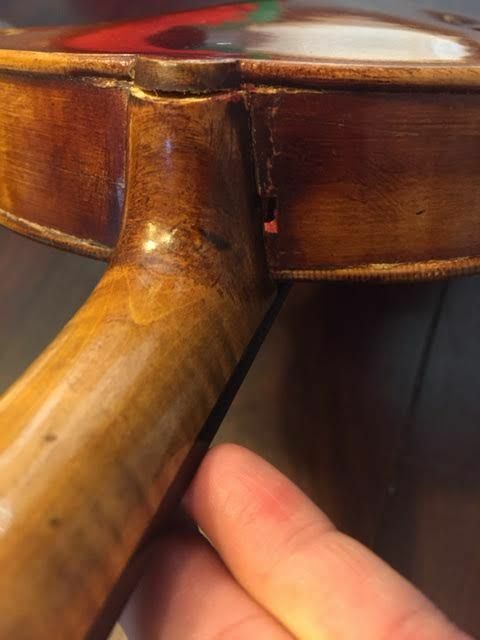 I finally said, “There’s nothing wrong with your cello; it just needs a bridge!” She said, “Oh, the bridge is here!” and produced the missing bridge. Even the soundpost was in place…so I installed the bridge, tuned the instrument, and played a couple of old hymns, just to check the sound. All was in order, and fully functional in about 15 minutes. She went home ecstatic, and I got a big smile, too. 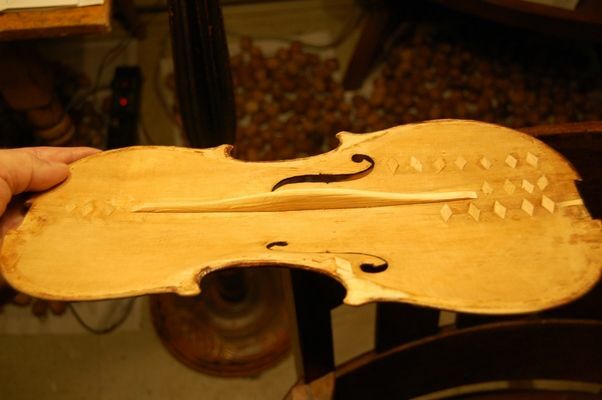 Scroll-graft, to salvage the scroll her father had carved, while replacing the damaged neck. Replacement of both the upper and lower end blocks. Removal of both upper corner blocks, and reinforcing both areas with false blocks. 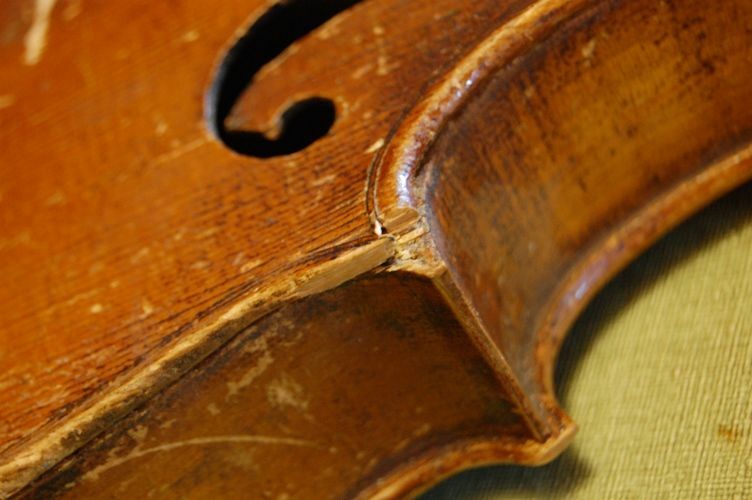 Repair of ten cracks, collectively, in the two upper ribs, both caused by wood shrinkage at the upper corner blocks. 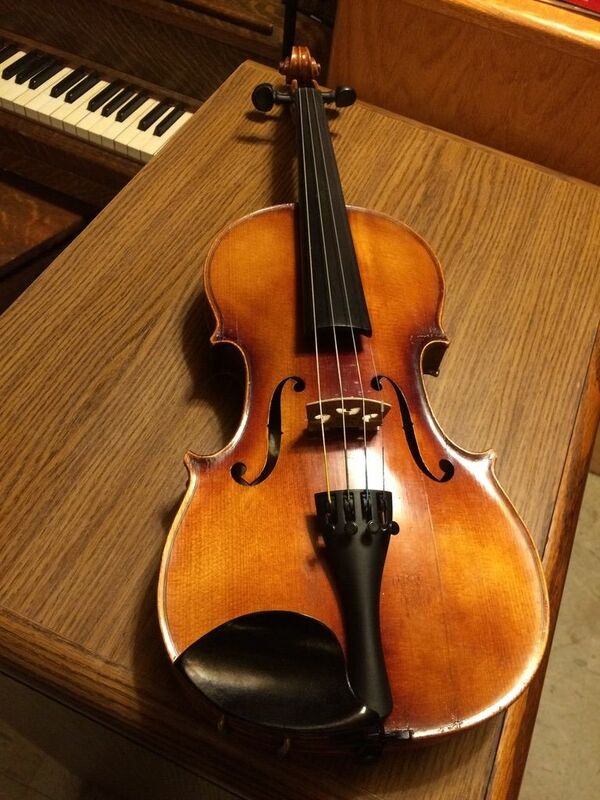 Installing purfling, and a new back button. 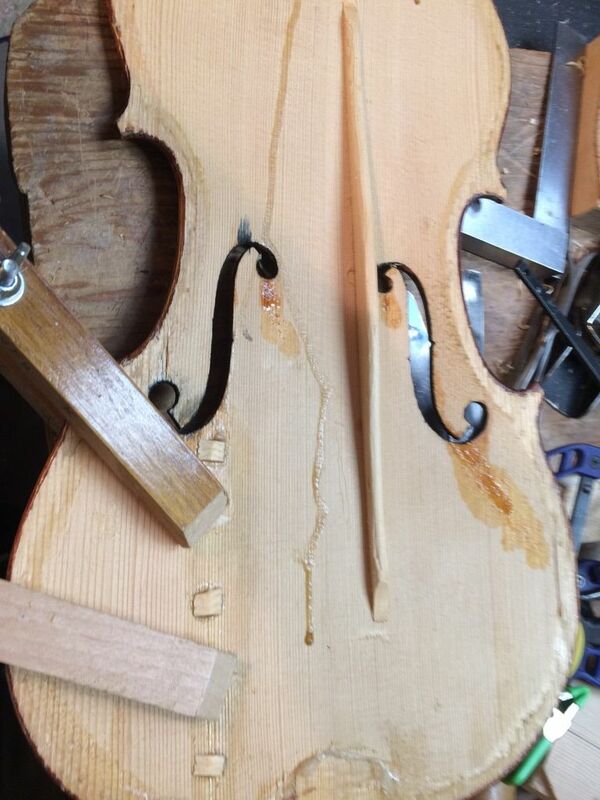 Re-setting of the (new) neck, in the new upper end block. 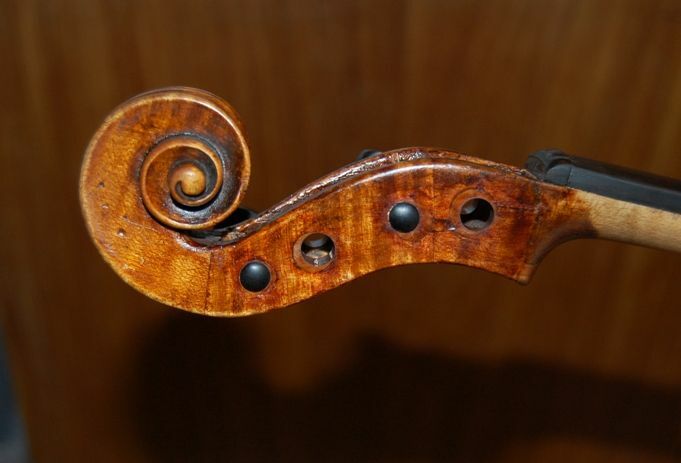 Installing a uniquely-shaped nut, to match the uniquely-shaped scroll cheeks. Installing an oversized saddle to fill the oversized cutout already removed from the front plate. 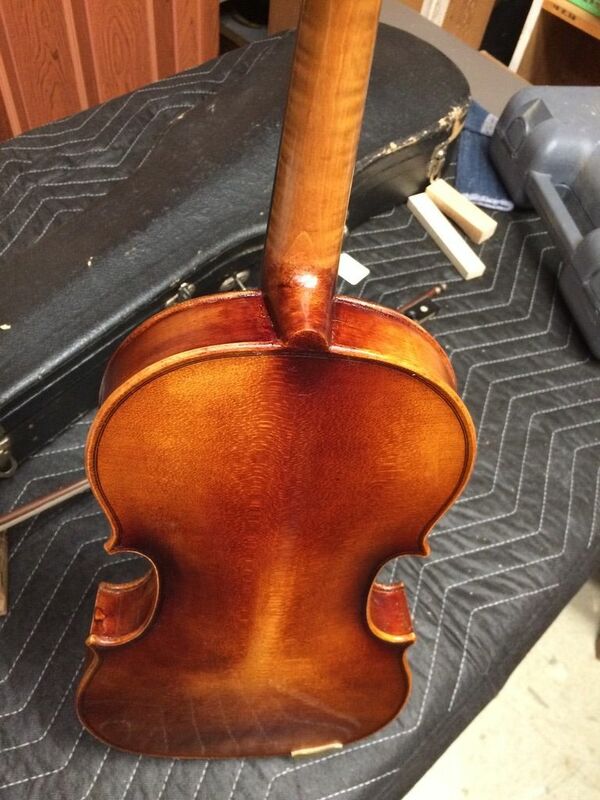 Complete varnish-prep, including correcting damages, as well as cleaning up (most but not all) tool-marks. 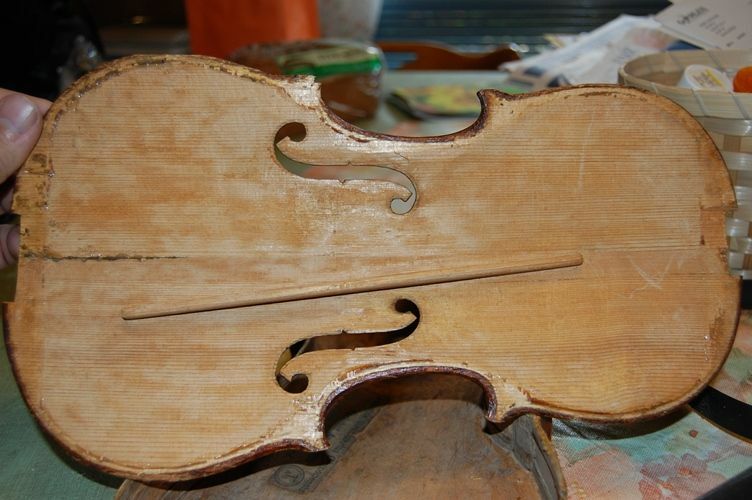 Complete varnishing-process, from raw wood. 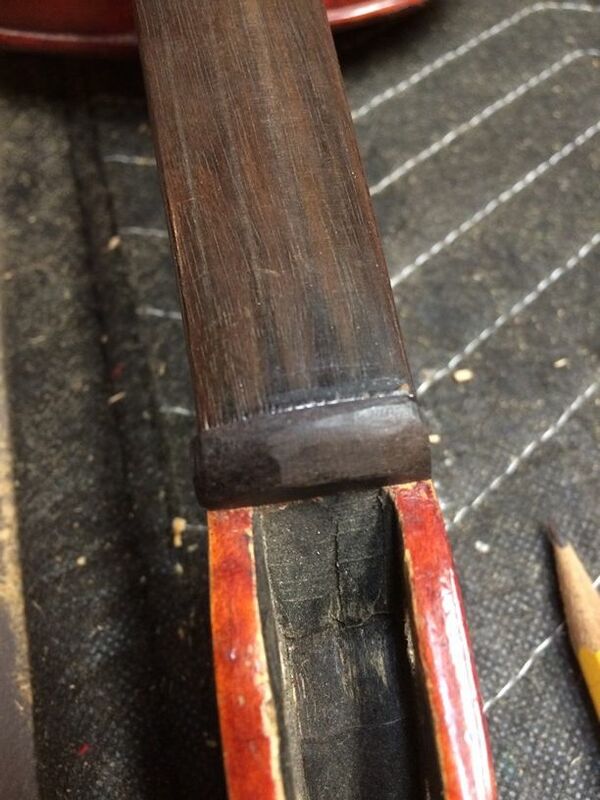 Installing a Rosewood end-pin assembly. 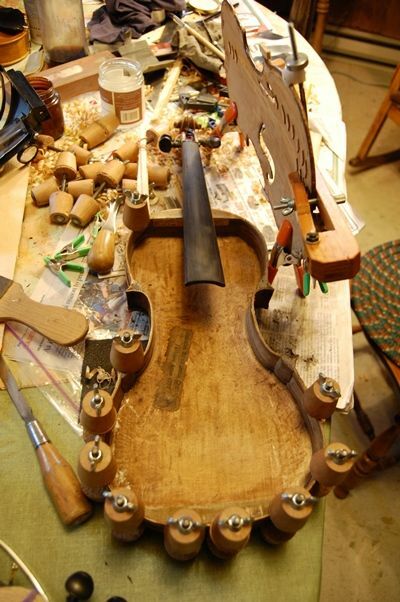 Installing and fitting a sound-post, as well as a bridge, and a Rosewood tailpiece with four built-in adjusters. 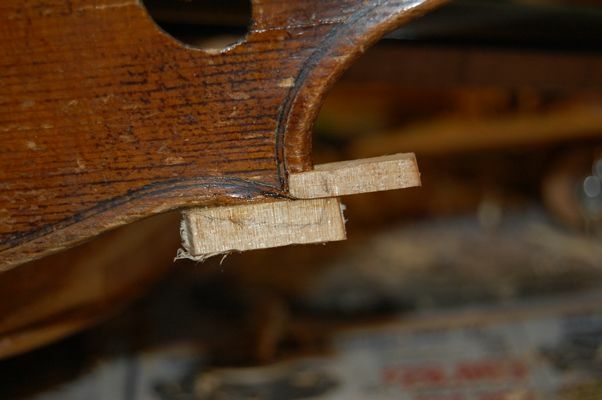 Plugging the original peg-holes, as they were in the wrong places, and establishing correct locations to install the new Rosewood pegs. 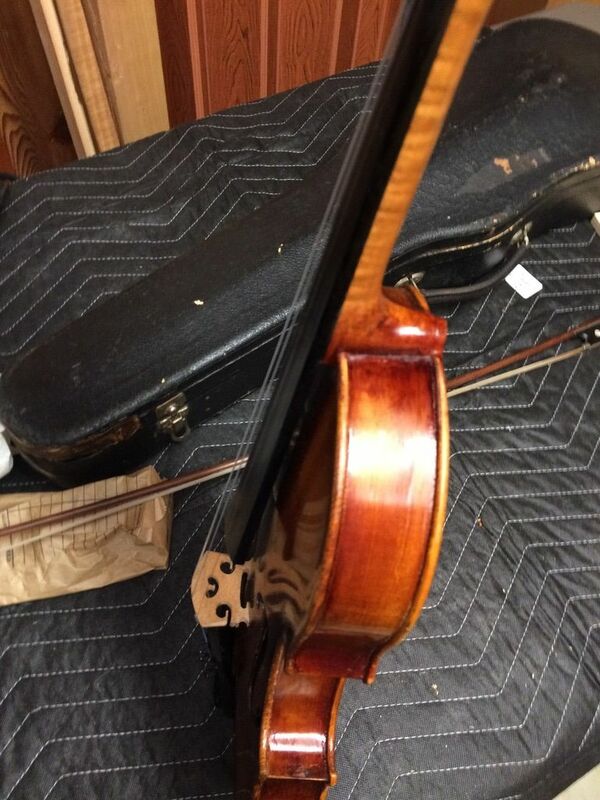 Strings, final adjustment and set-up, as well as a week of play-in, and applying a wolf-eliminator. 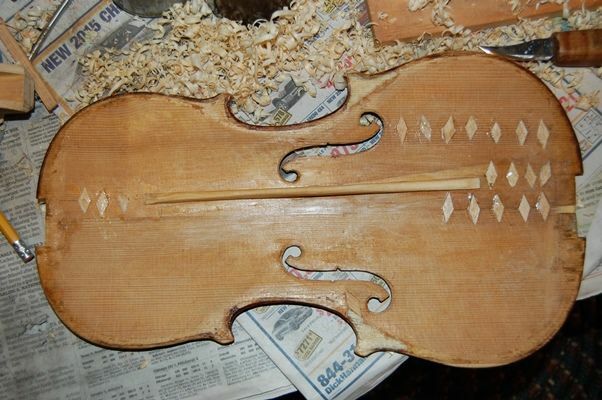 It was lots of fun…her father had chosen beautiful wood, and the resulting instrument has decent sound, too. 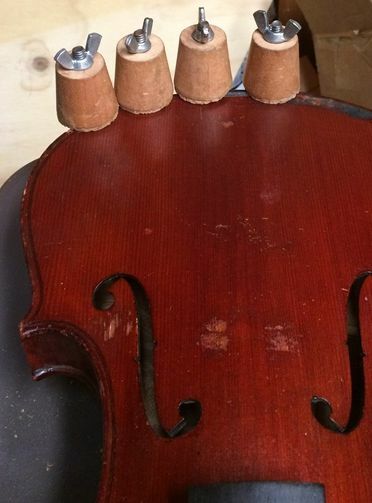 It just was far more time-consuming than I had expected, so she patiently waited to get her cello back, and was quite gracious about the extra time involved. Over all, it was a very good experience, and we both went away happy. The whole saga was posted on Facebook, so I allowed my website to languish during all those months. 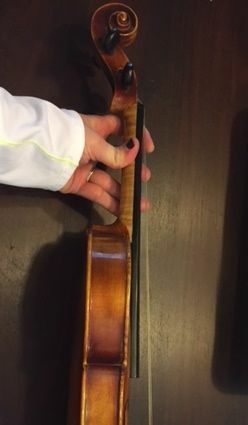 This Violin came to me because a young lady in Alabama had read my article on violin repair, and decided she wanted me to fix her fiddle. 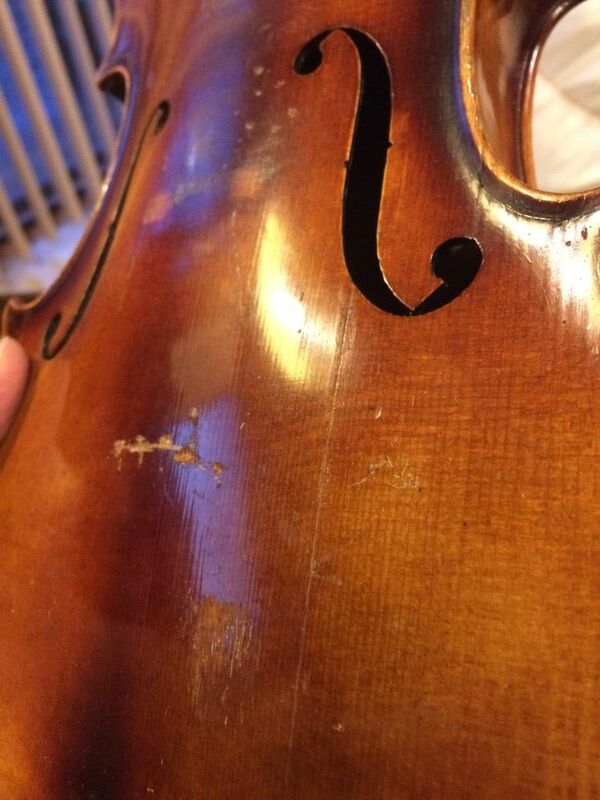 She sent me a few photographs to see whether I thought it was repairable and worth repairing. 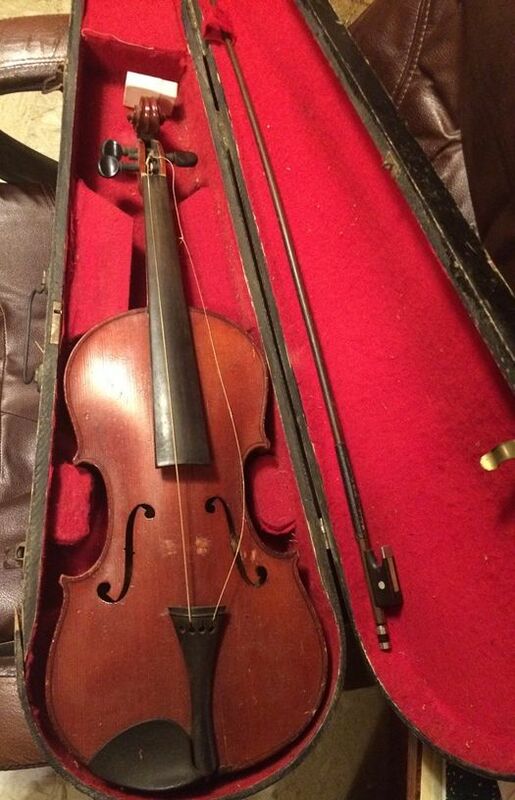 I said yes, on both counts, and she shipped me the violin. 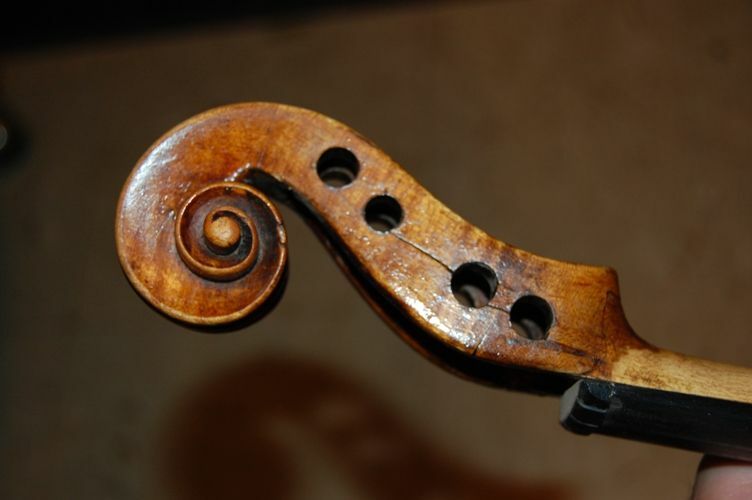 She knew that it was not an expensive, high-quality violin, but it was special to her, and she felt that the investment would return a better violin for her to play than the cheap one she was currently playing, and give her more pleasure as well, because of the sentimental attachment. 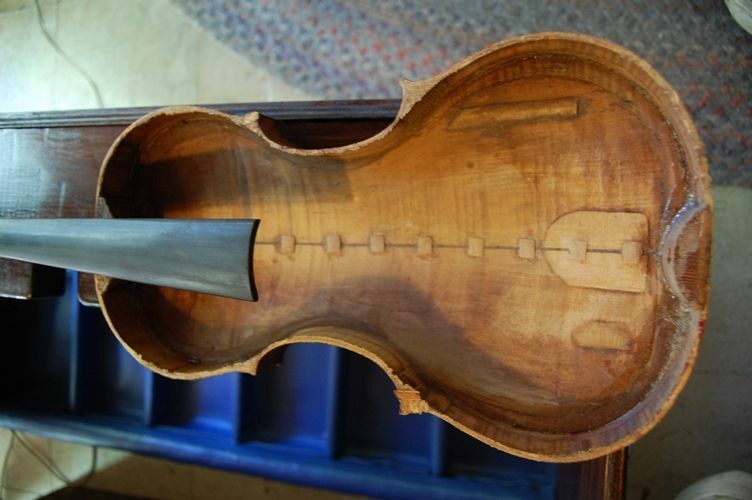 Original view–first sight I had of the instrument. 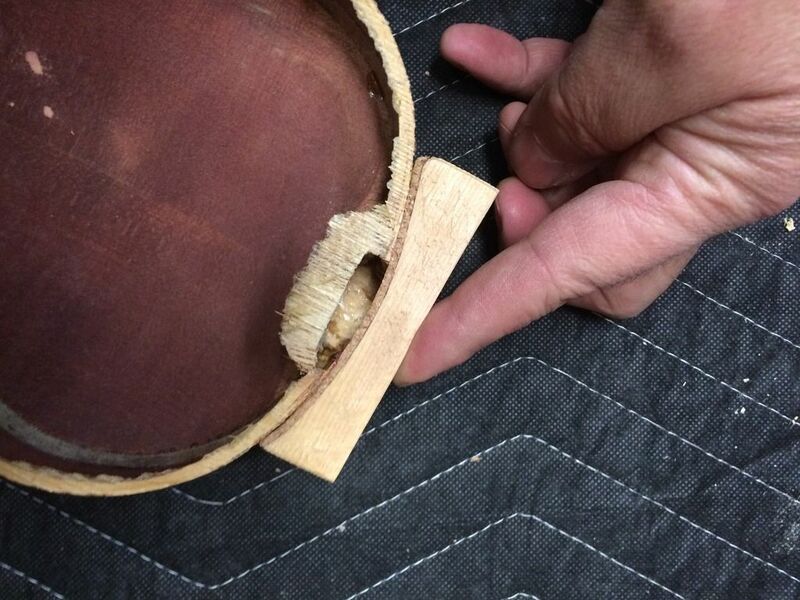 The heel is separated, and the fingerboard is flat on the belly. 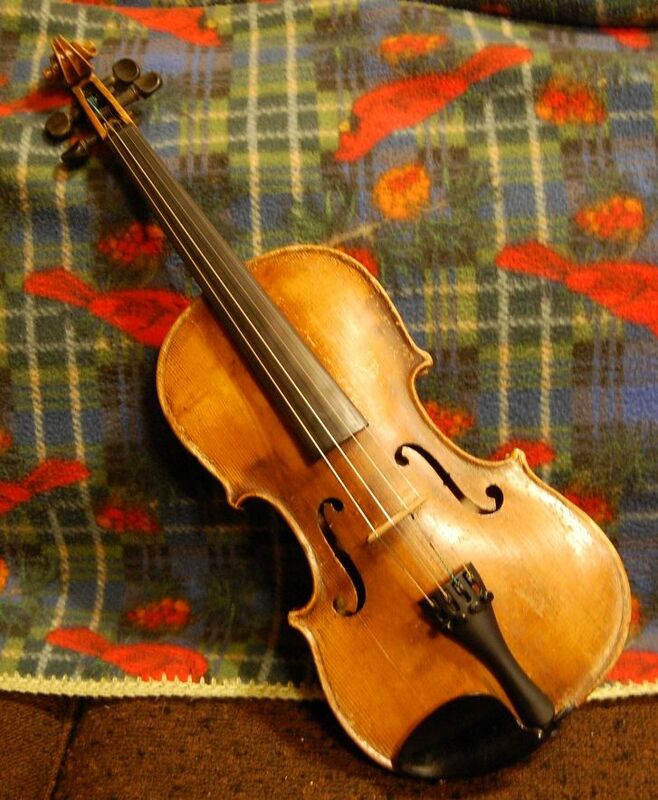 She sent me the fiddle, carefully packed, and it arrived unharmed. 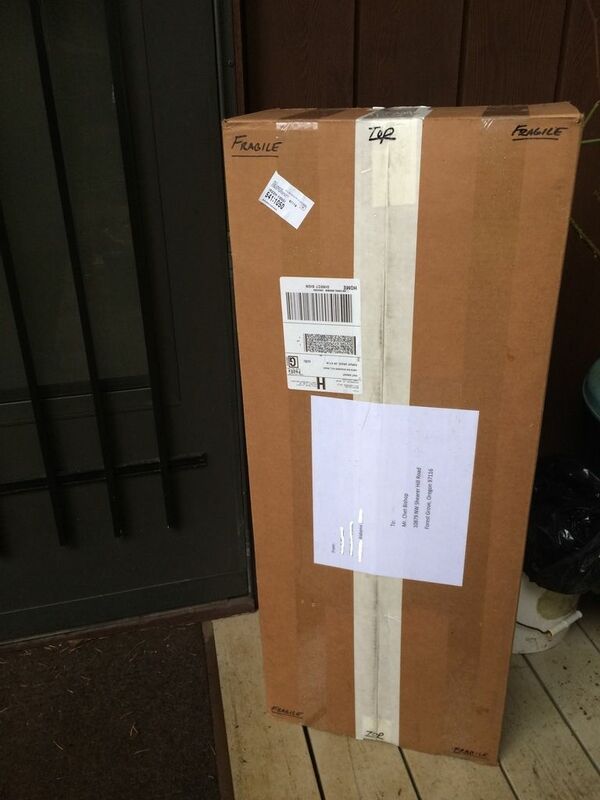 Fortunately, I got home immediately after the FedEx people dropped the package on my porch, as it was raining hard, but the package was nearly completely dry. 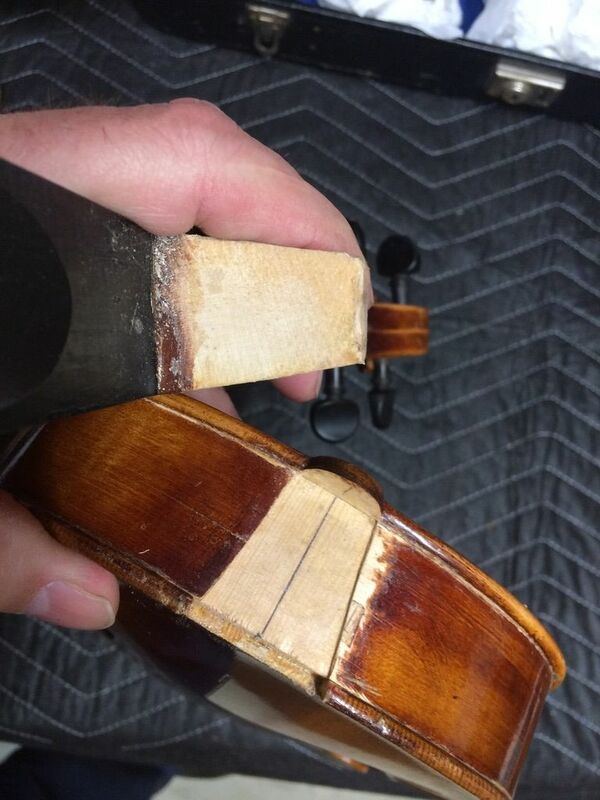 Neck heel is separated from the block, and the block is broken. 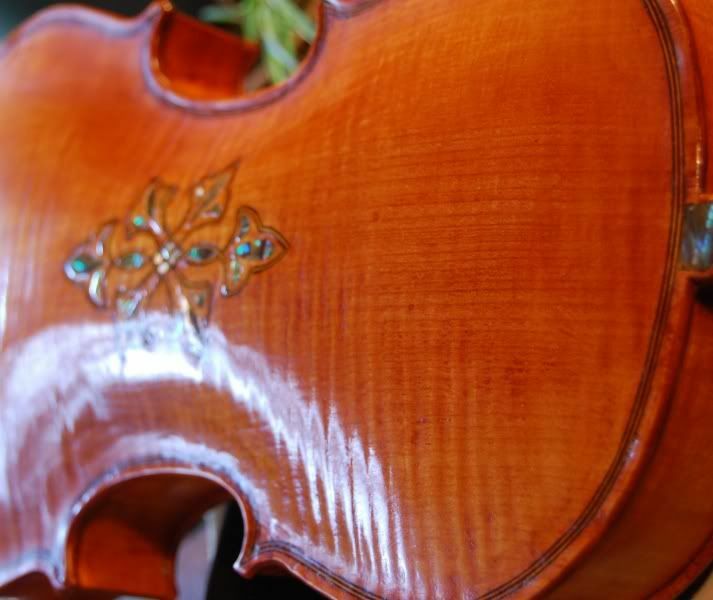 The treble side upper bout rib is damaged at neck joint (and is “re-touched” with red ink). 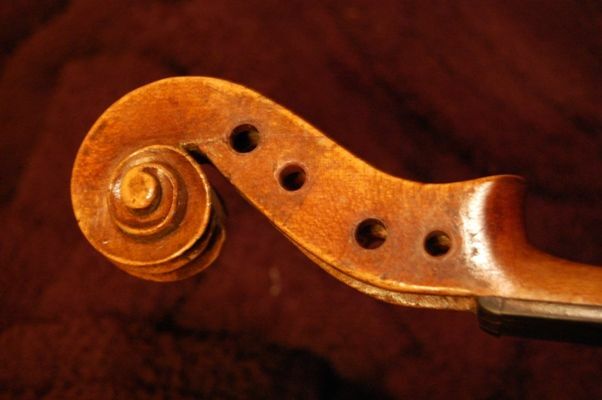 There is missing wood at the heel of the neck. 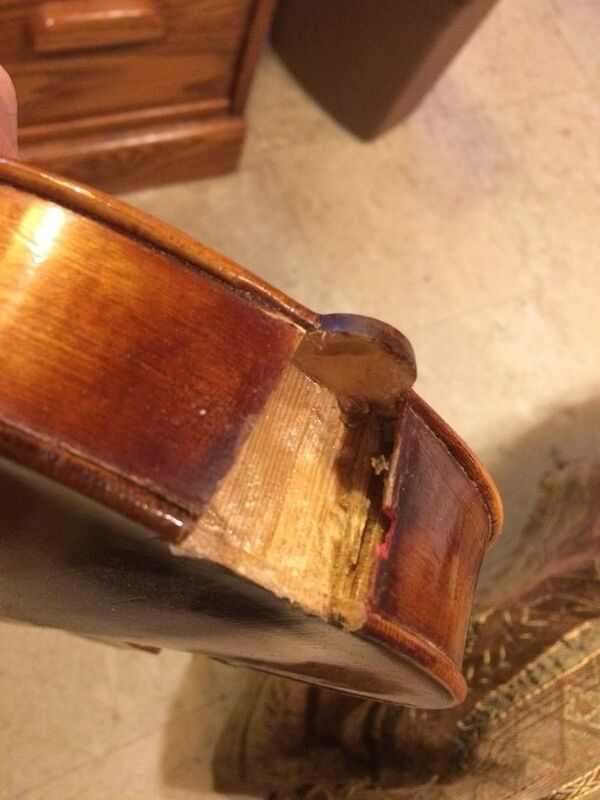 There is at least one repaired crack in the top plate. 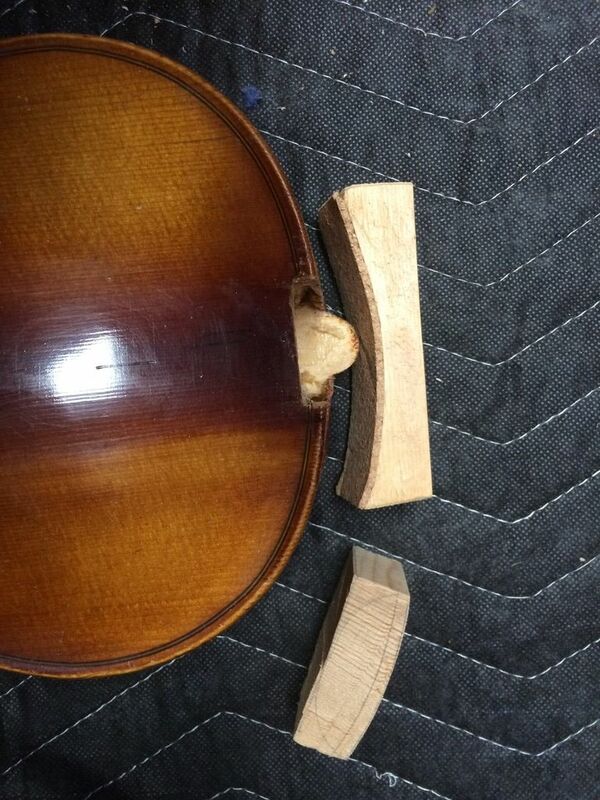 Pieces of broken neck-block still glued to neck heel. The neck came off in my hand. 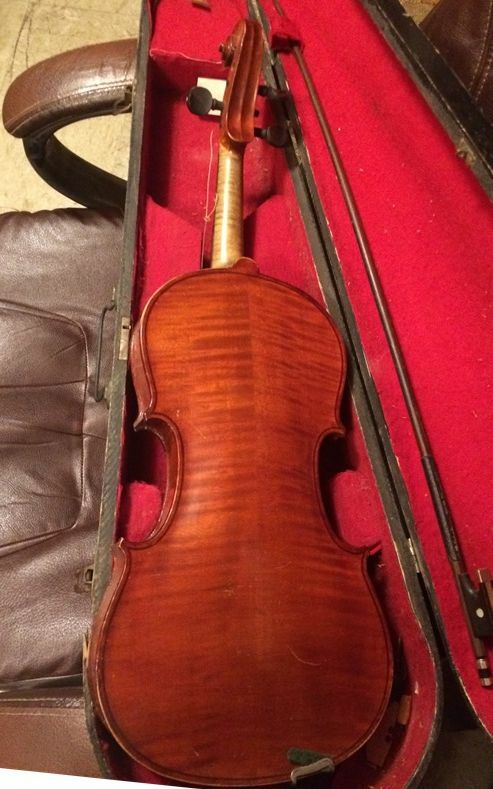 Missing wood from both the neck block and the treble rib…”retouched” with red ink. 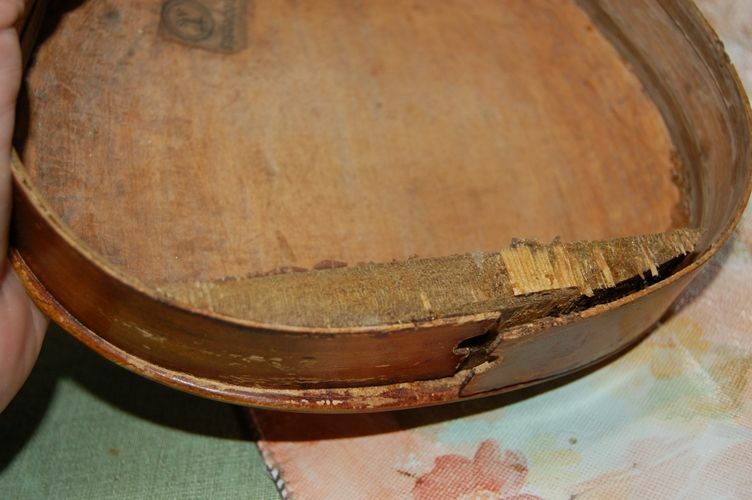 Existing (repaired) crack, and numerous abrasions, chips, etc. 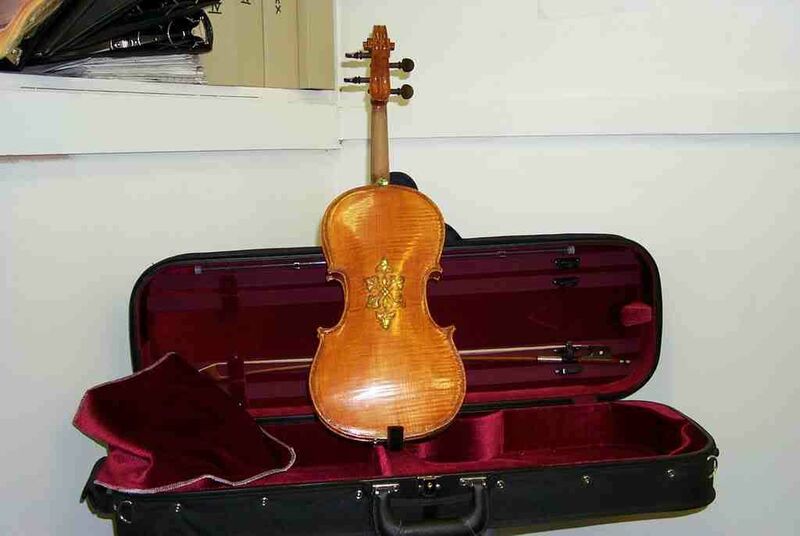 Remove all the fittings and strings; store them in the case pocket. 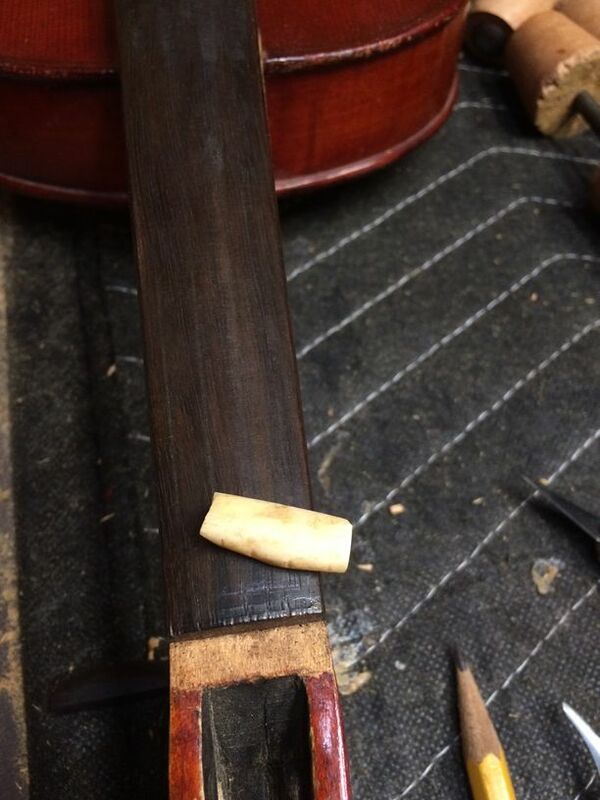 Make a cork-lined clamping caul, to hold the ribs in proper alignment. 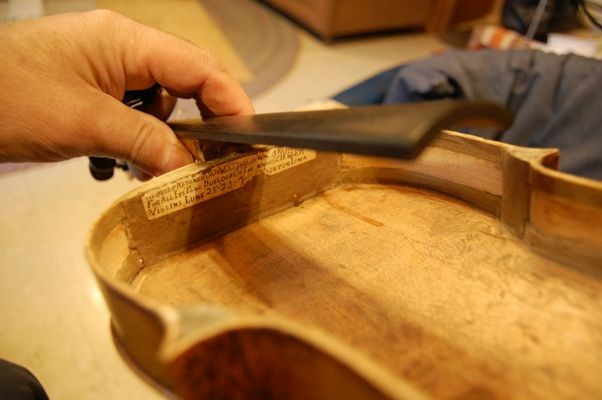 Remove the top plate and inspect all interior conditions. Crack repair was “OK”, but minimal: add 2 cleats, clean up the three old cleats. 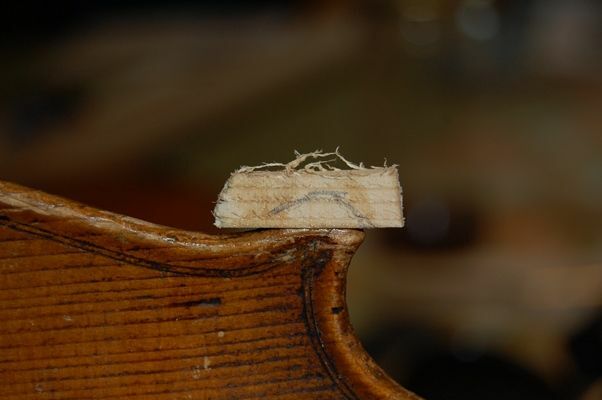 There is missing wood from previous top removal. Repair it, before closing. 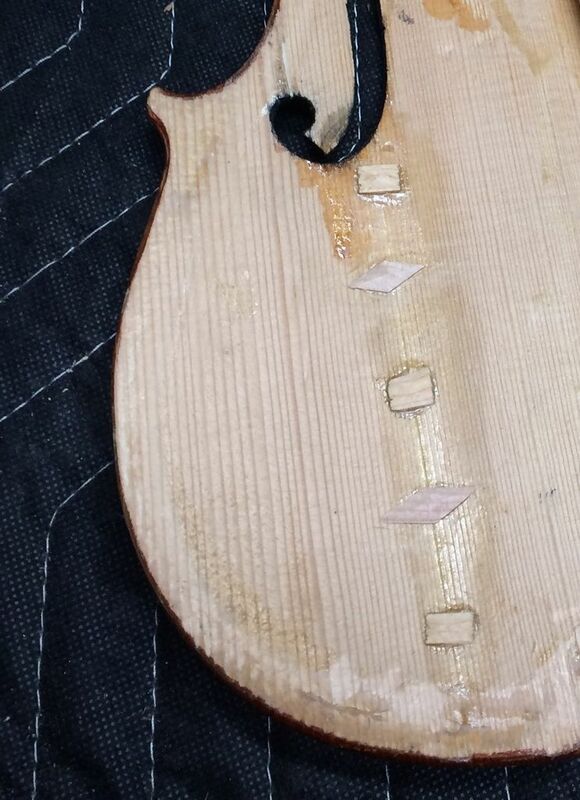 The bass-side upper bout rib is cracked. Repair it before closing. 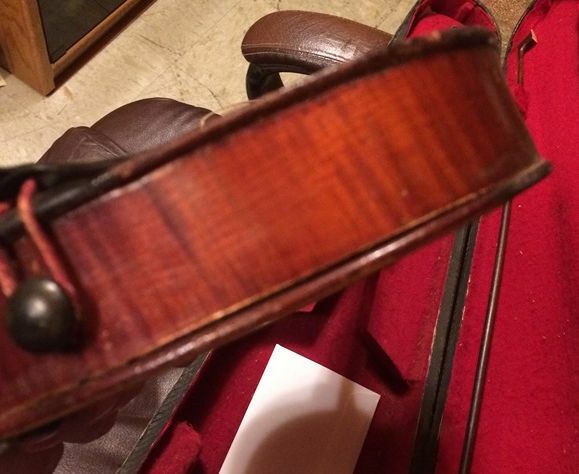 The saddle fell off—re-install after closing. 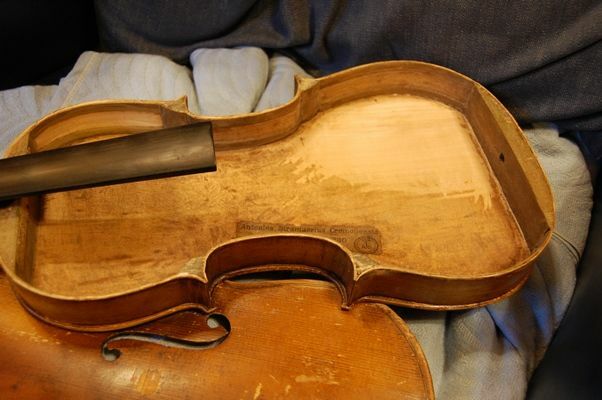 Repair the damaged ribs, and replace the missing wood at the neck-heel. Install the new block, using hot hide glue and clamping caul. Level the front of the garland. 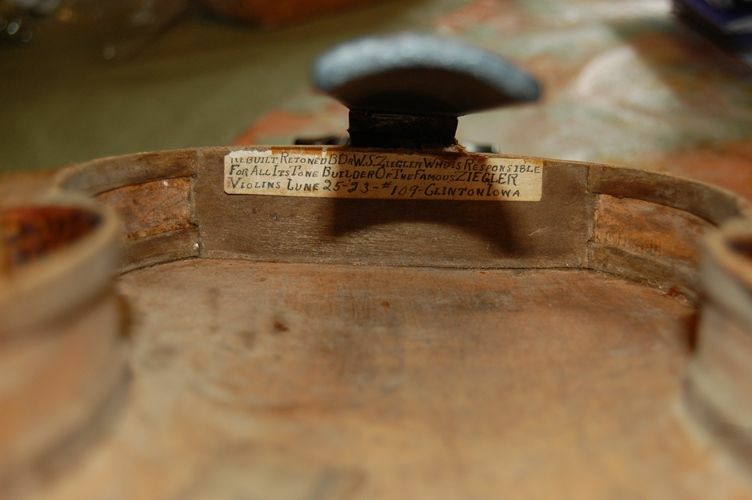 Re-install the repaired front plate, including original saddle. 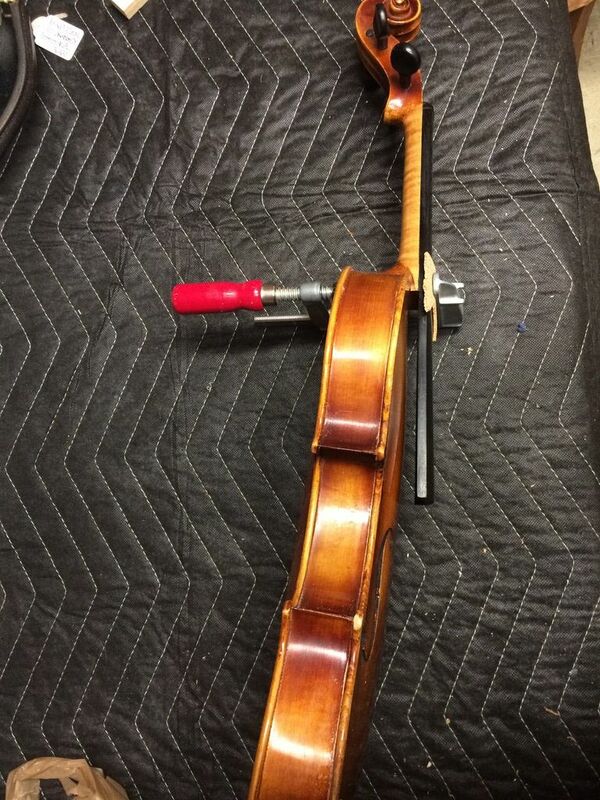 Set-up the violin, using old pegs and chinrest, but replacing all else. 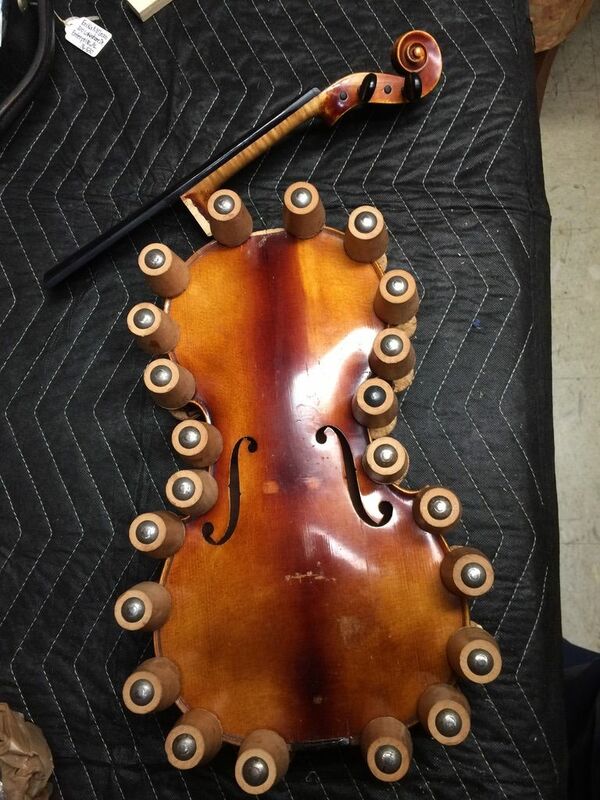 Play and adjust for best sound. 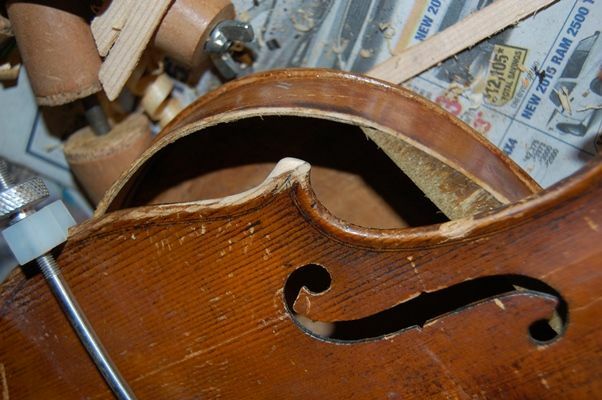 Old neck block has been removed, and the treble rib has been tapered to receive the new wood. 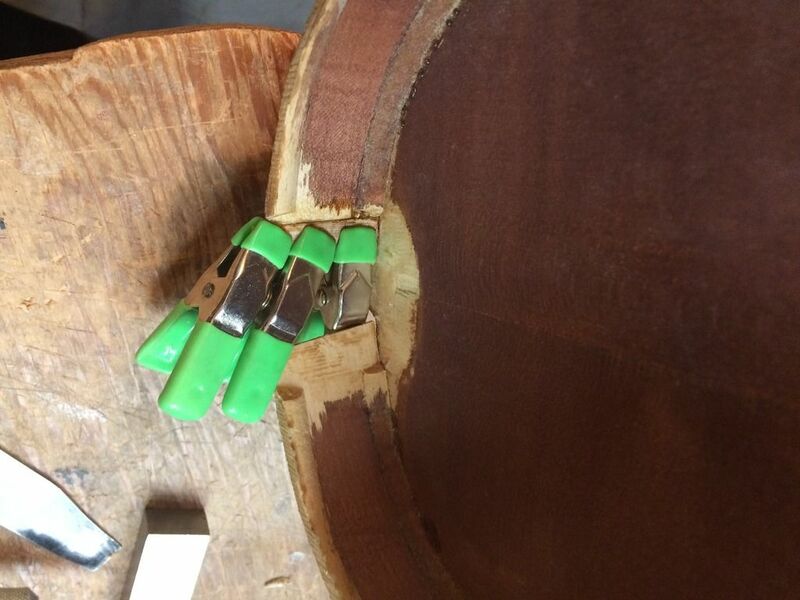 New rib wood glued and clamped in place, on the treble rib. 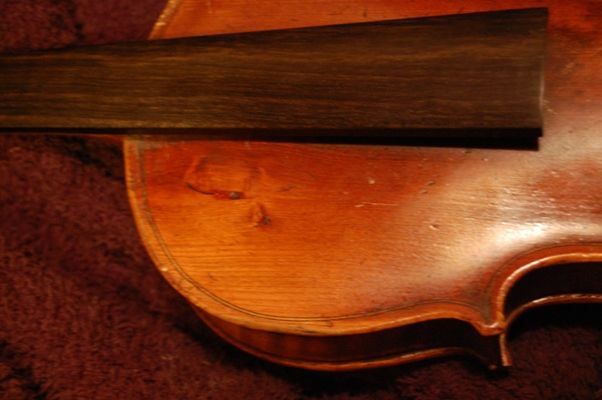 The bass rib is also cracked, but it is hard to see at this angle. 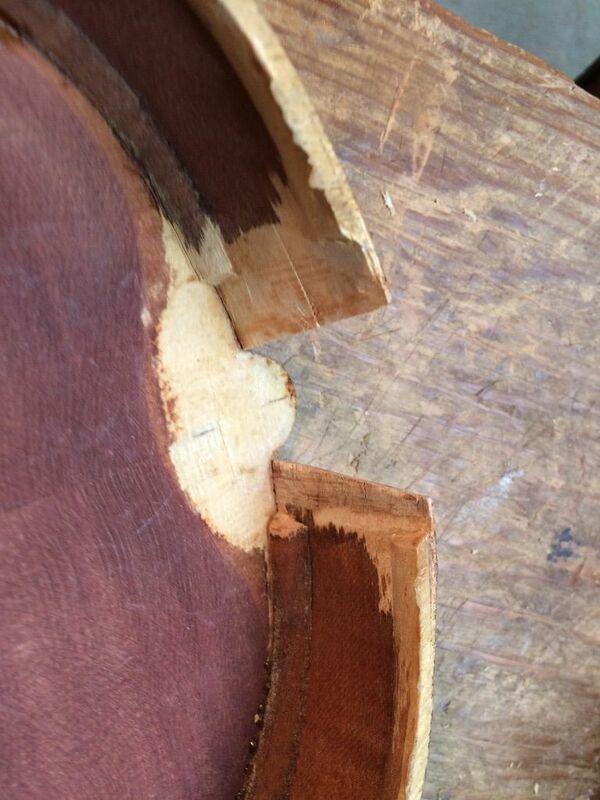 Repaired treble rib, cracked bass rib. 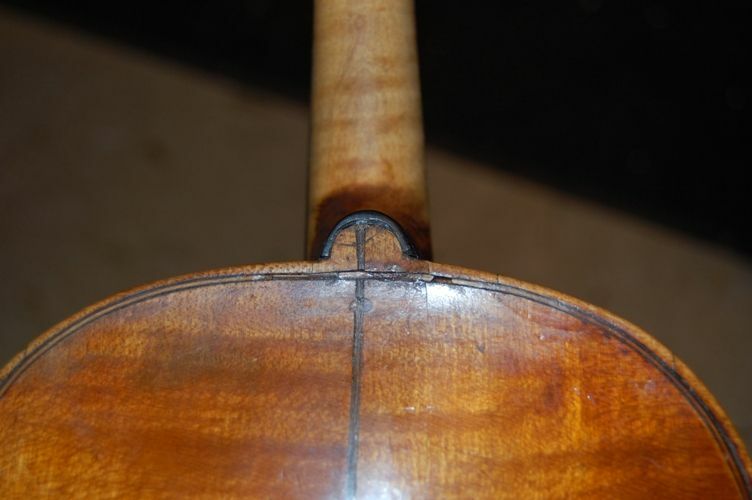 Outside view of rib repair. 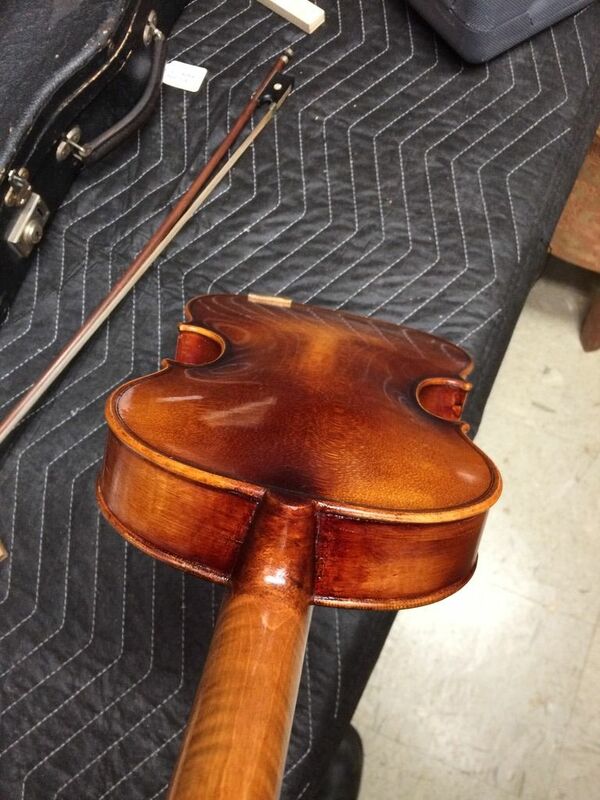 New neck-block, glued and clamped. New neck-block installed and garland leveled. 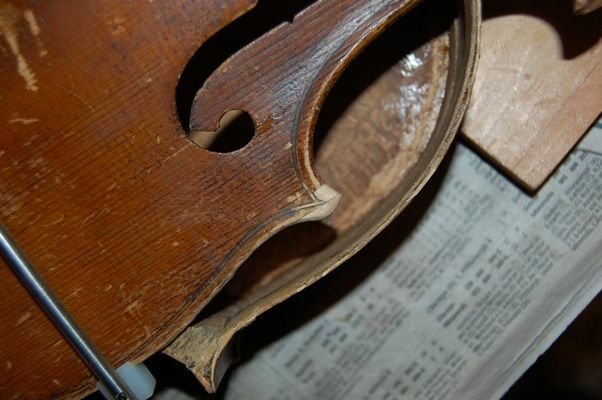 There was also missing wood at the neck-heel: At some point in the history of this fiddle, it had been snapped loose from the neck block, and a piece of wood about the size and shape of a fingernail had chipped out of the gluing surface of the neck. 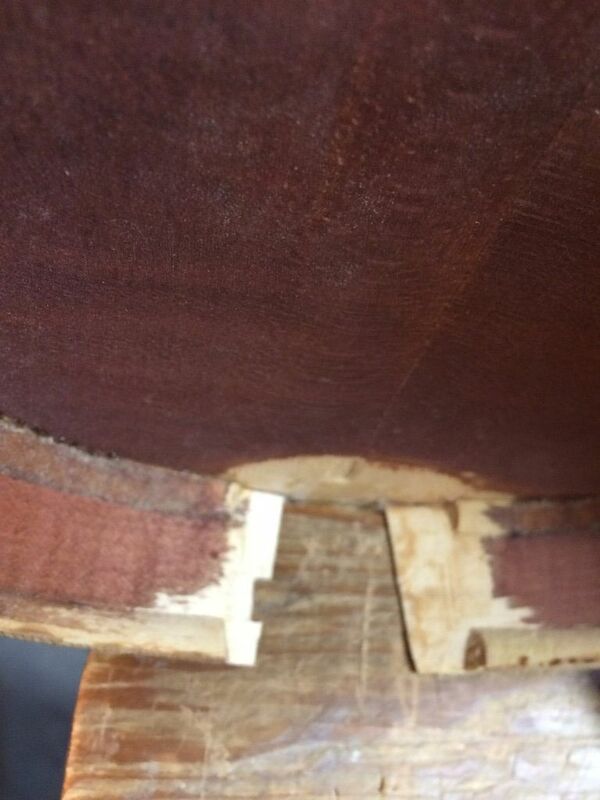 (photo up above) This is a critical joint, so the wood had to be replaced. 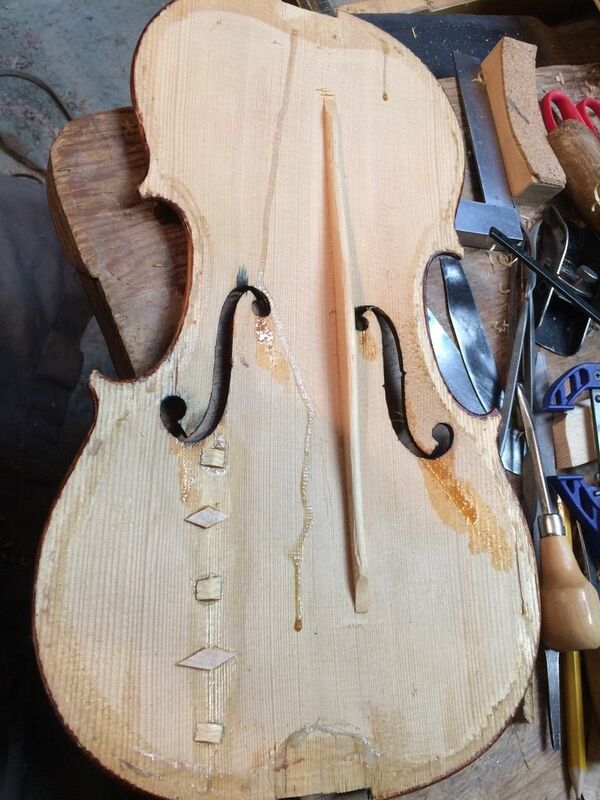 I soaked a thin piece of aged maple in hot water until it was flexible, during which time I scraped smooth the scooped out place in the heel. 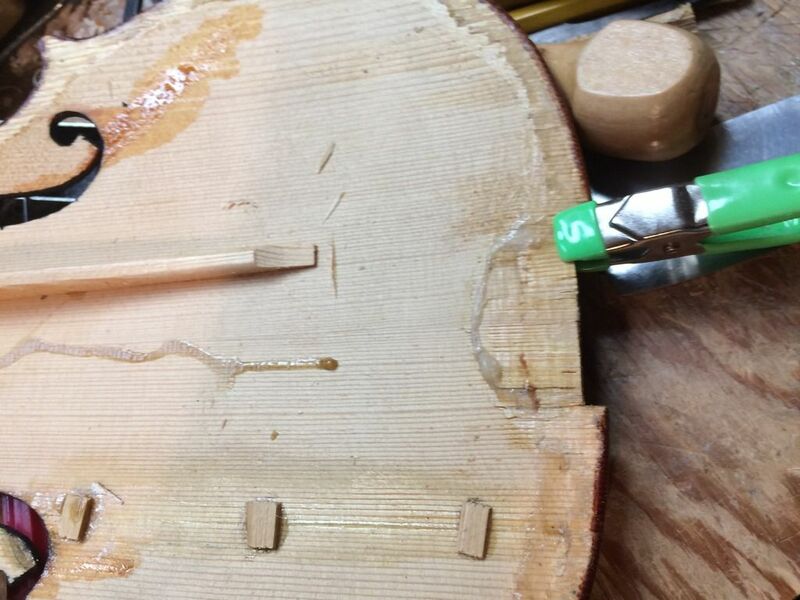 Then I slathered in the hot hide glue, and clamped the now-flexible maple into the “scoop”, using a cork for a clamping block. 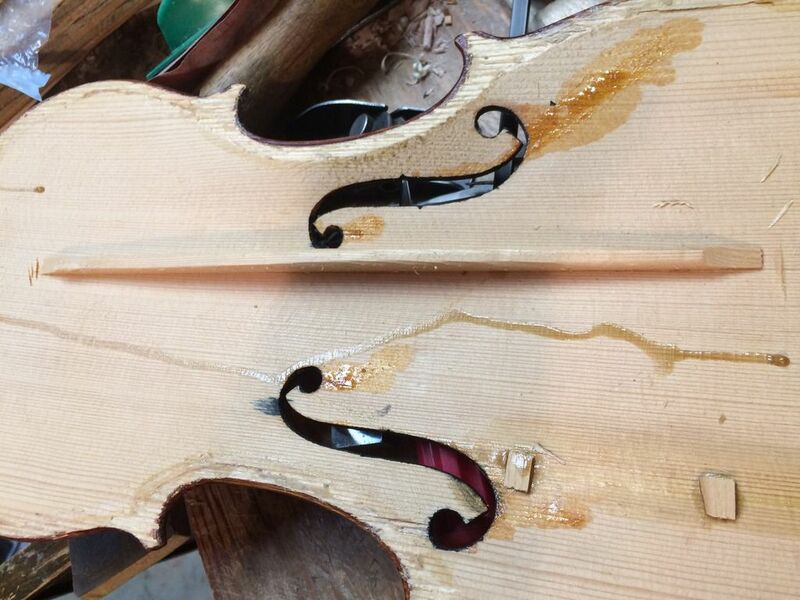 When the glue was completely dry, I planed the wood flat to match the original shape of the neck heel. 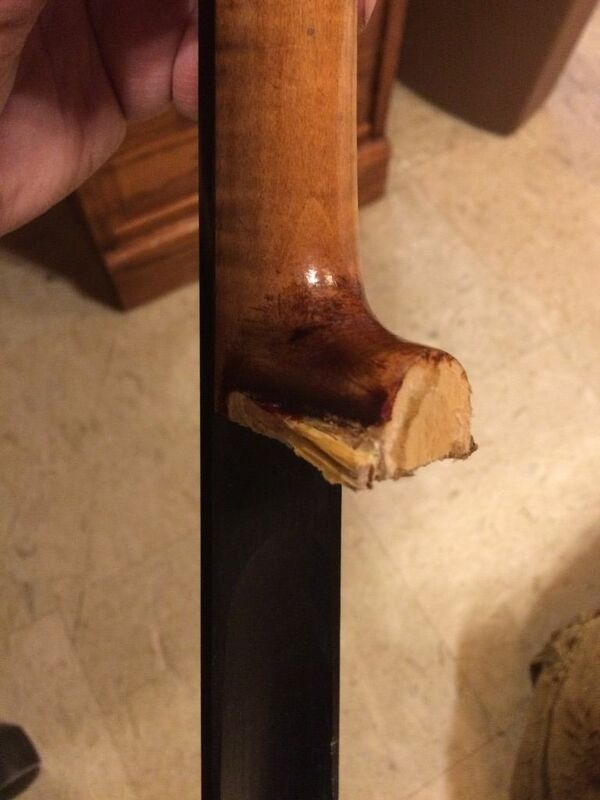 Missing wood replaced and planed flat. 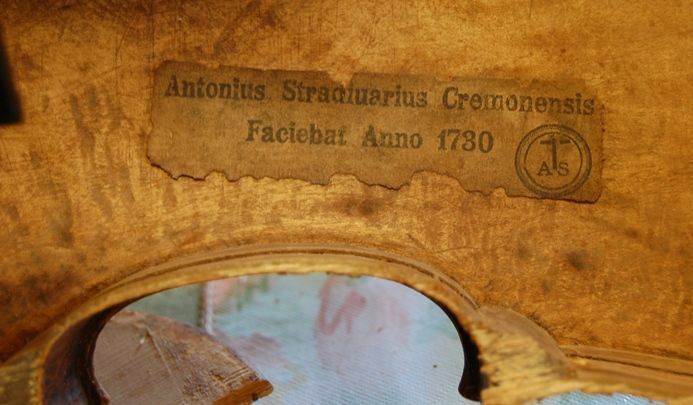 Meanwhile, the inside of the top plate needed attention: there was a (poorly) repaired crack to attend to, several bits of missing wood, etc. 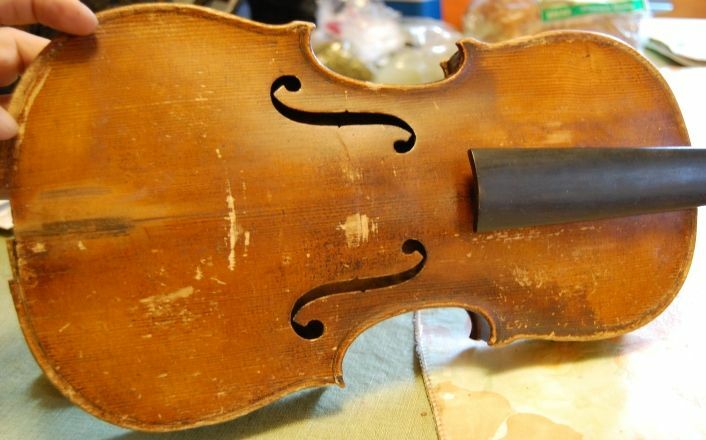 The old repairs were pretty crude…but mostly holding, so I only cleaned them up and improved upon them a little. 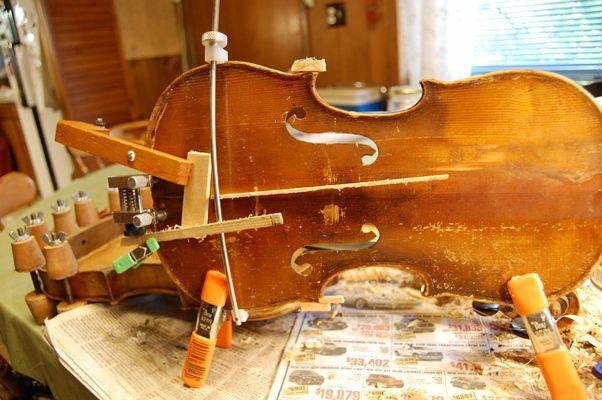 Some of the previous repairs had been achieved using Elmer’s Glue…not an appropriate adhesive for violins. That is what the whitish-clear stuff is, above. 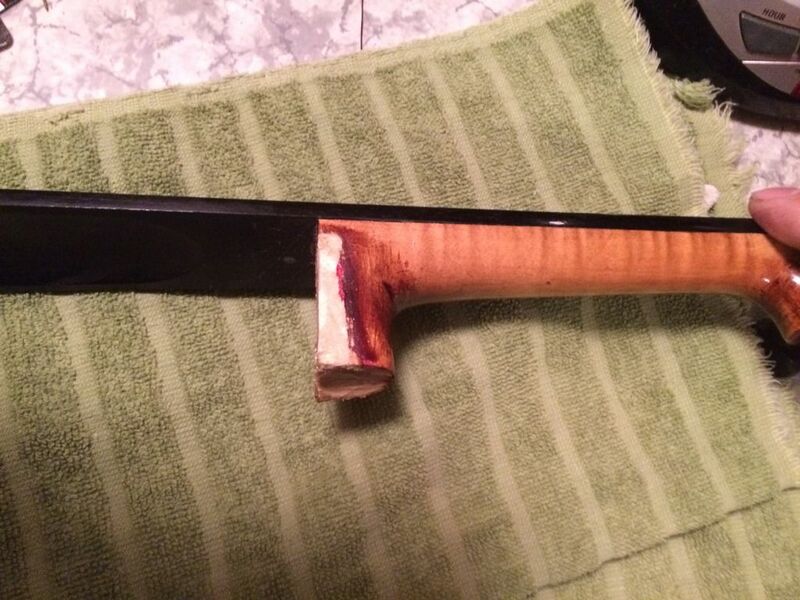 I replaced any missing wood using spruce, cut to fit, and hot hide glue. While I had the top off, I cleaned up the old crack, and added two more diamond-shaped cleats. 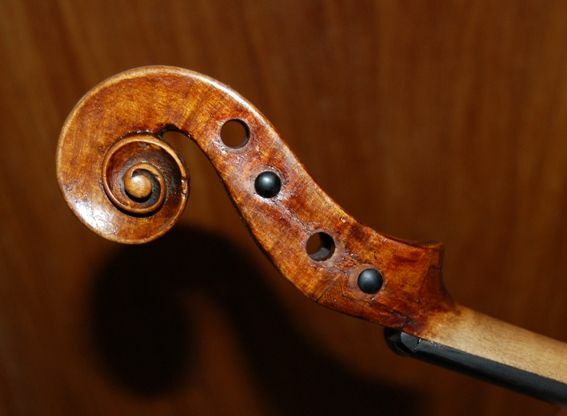 The importance of this shape is that it minimizes stress on the grain of the undamaged wood. 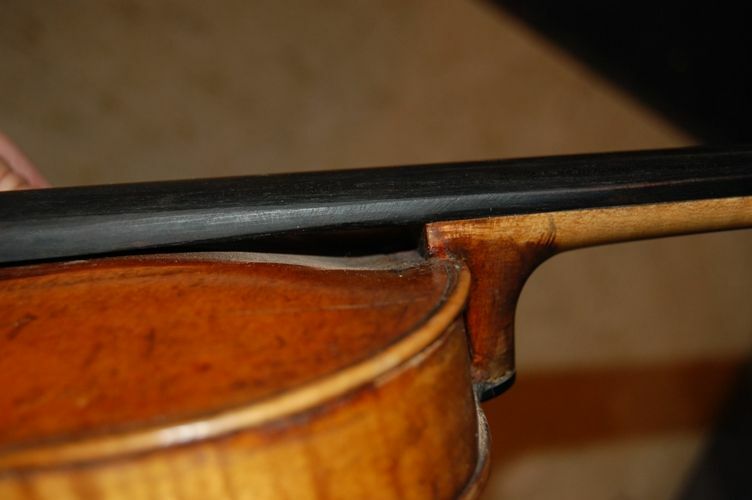 That square, block (center cleat) above could cause a new crack to form along its edge. 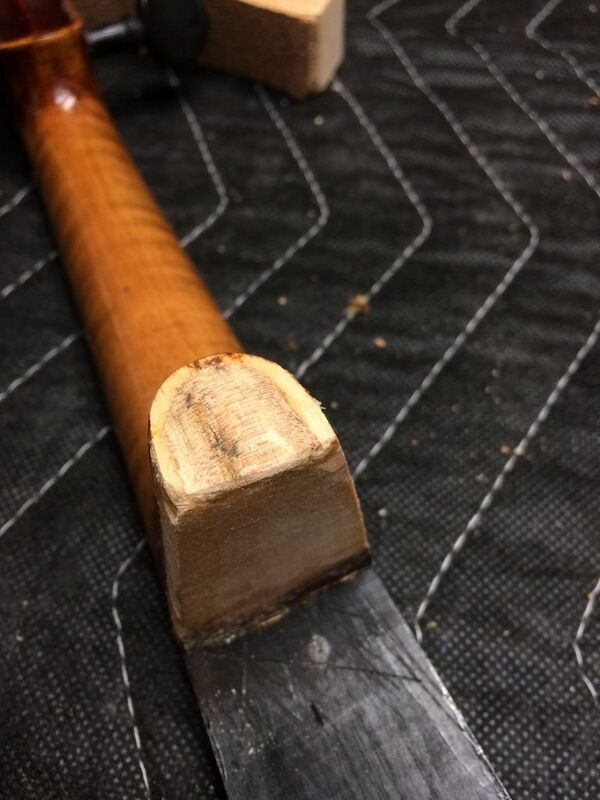 I eventually carved the old cleats to a thin taper, to minimize the danger. I cleaned up the crack to receive the new cleats, daubed them with hot hide glue and clamped them in place. You can see I have begun tapering the old cleats. New diamond cleats in place. They still need to be tapered. 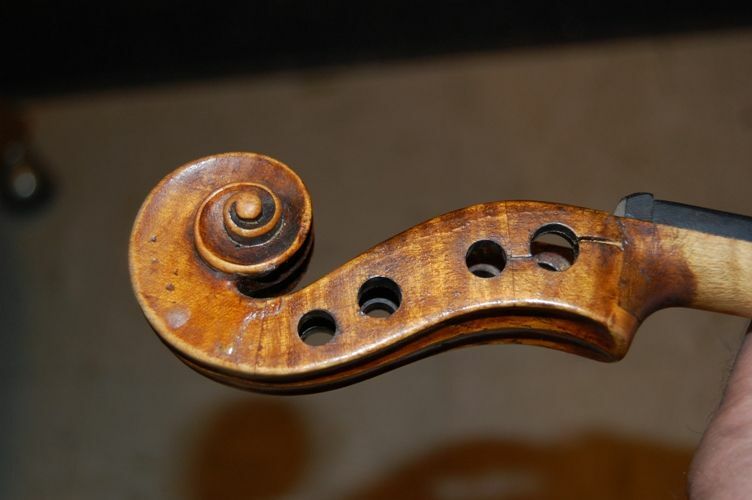 The missing wood near the f-hole will also be replaced. 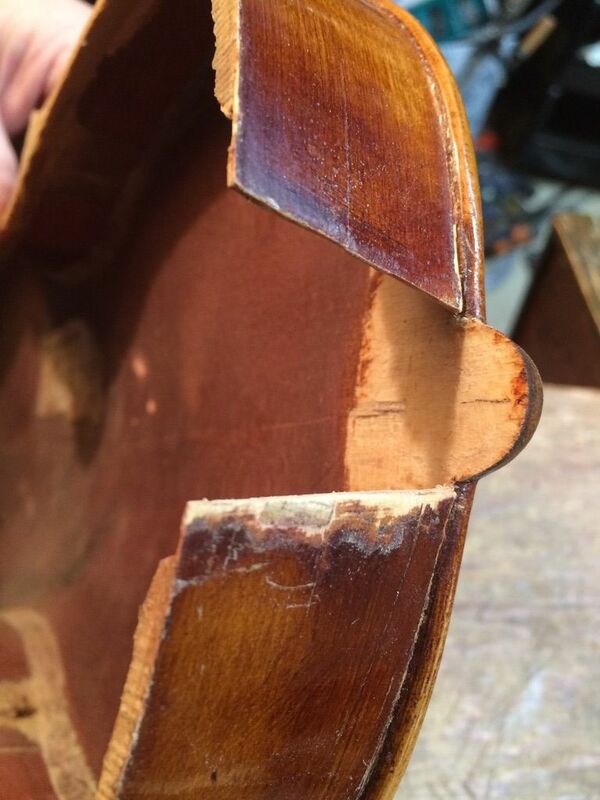 The cleats are all tapered, and the missing wood is replaced. Finally, the top can be re-installed on the garland. 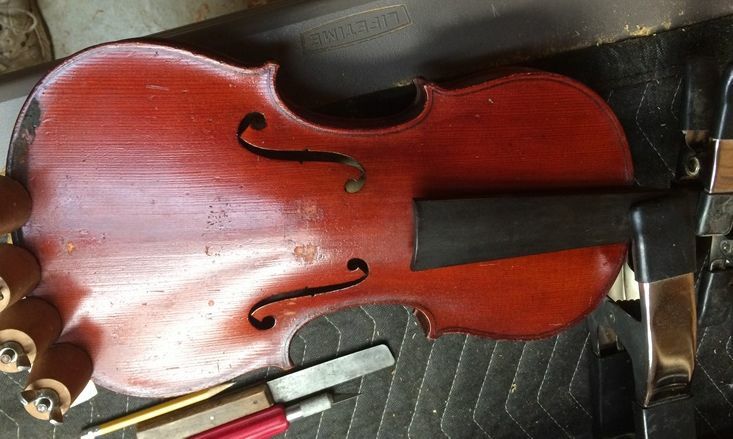 First I leveled the garland, so that any inconsistencies caused by my replacing that neck-block will be eliminated, and the top will fit cleanly. 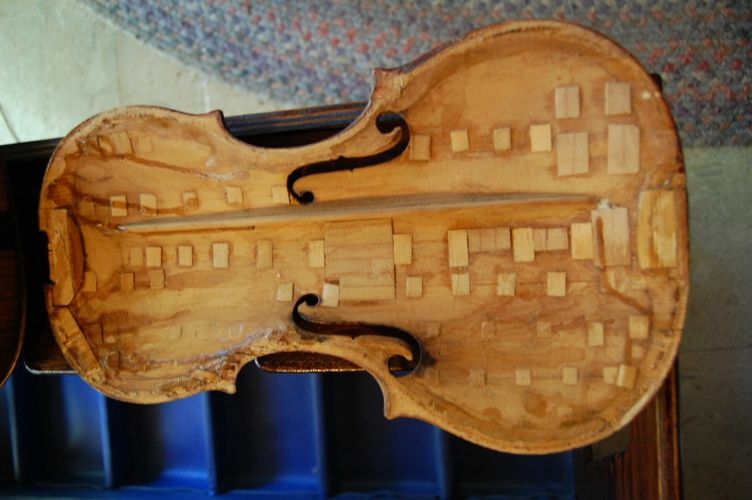 Then I dry-clamped the top in place, and, loosening a few clamps at a time, I inserted hot hide glue all around the edges, especially at all six blocks. As I completed the glue insertion in each area, I replaced the clamps and gently re-tightened them, then cleaned off any glue squeeze-out. The result? 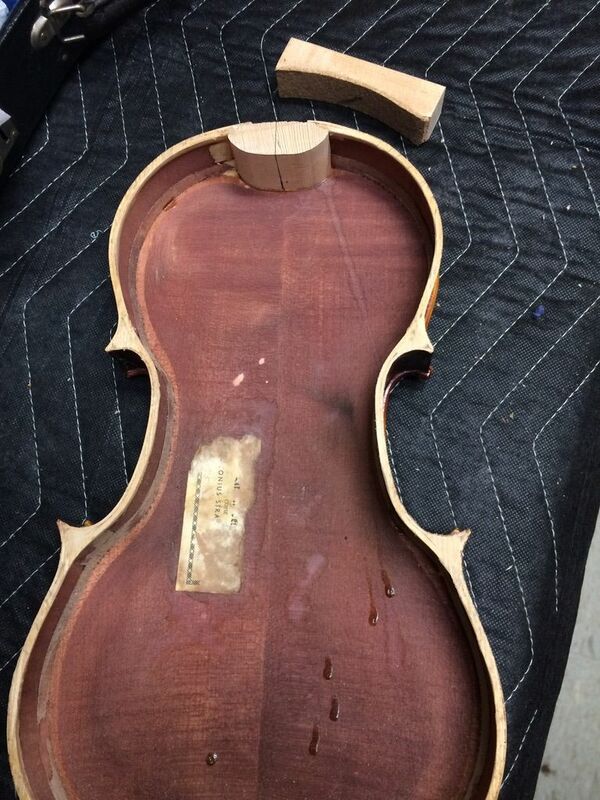 The body is reassembled and the next step is re-setting the neck. 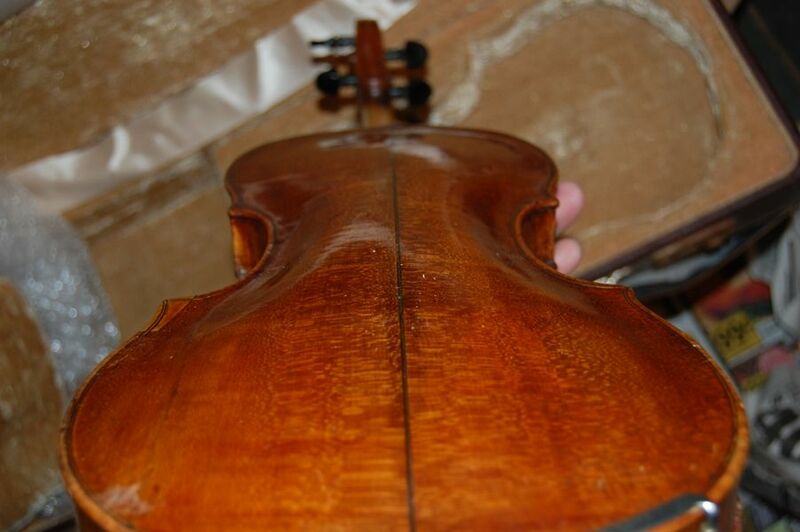 The top is safely reinstalled, and the neck is ready to be re-set. 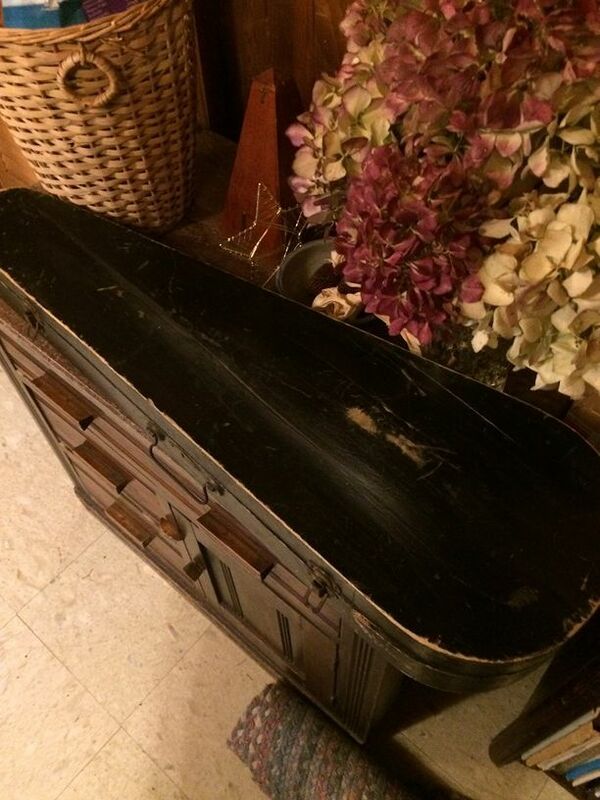 All the scuff marks are still there. 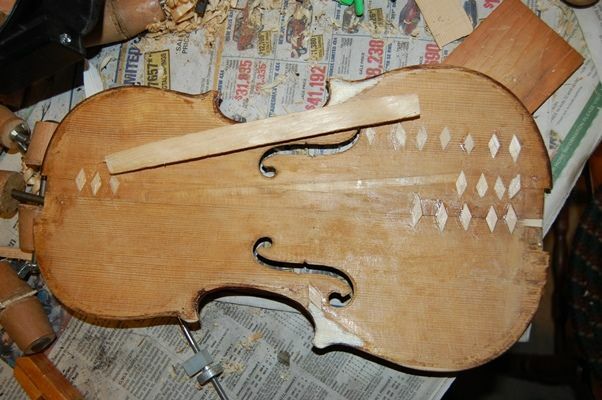 The neck mortise has to be carved out with chisels and other tools to exactly match the shape of the neck-heel. All angles and surfaces are critically important. 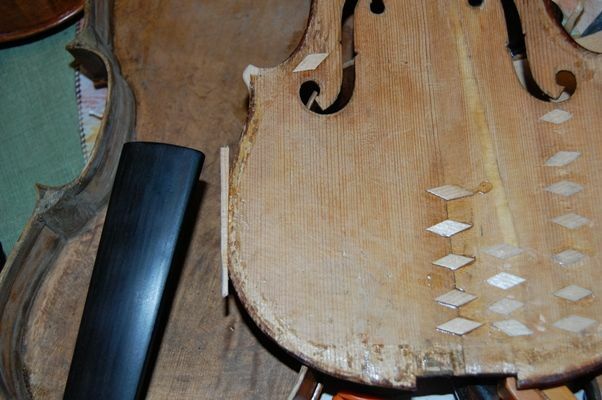 Once the neck is fitting exactly, I double check all dimensions and angles and finally slather hot hide-glue in the joint and ram the neck-heel home, checking rapidly to make sure everything is still correct. 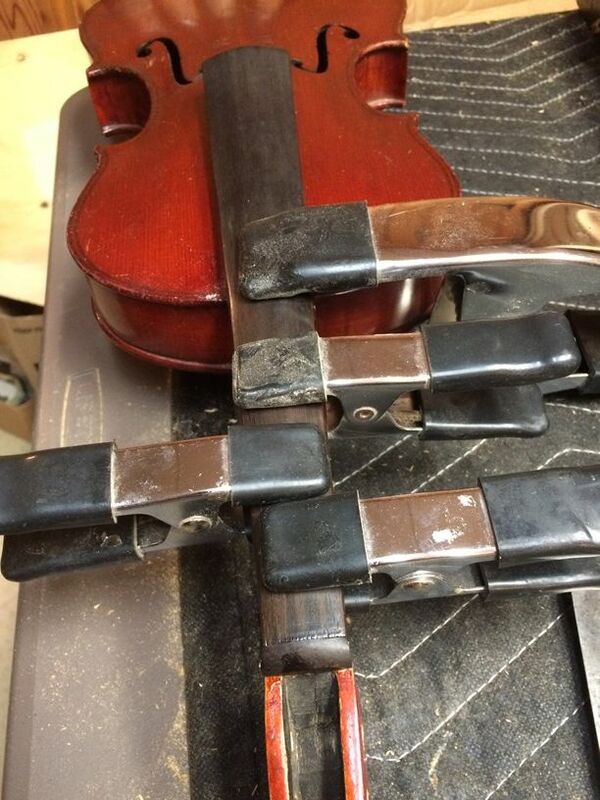 Then I clamp it so that it stays secure until that glue is fully set and dry. 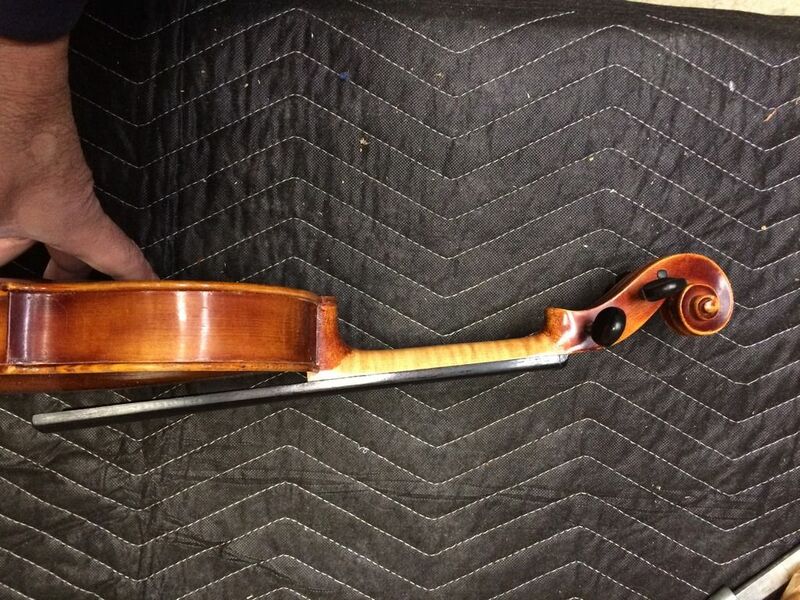 And there is the new neck-angle! 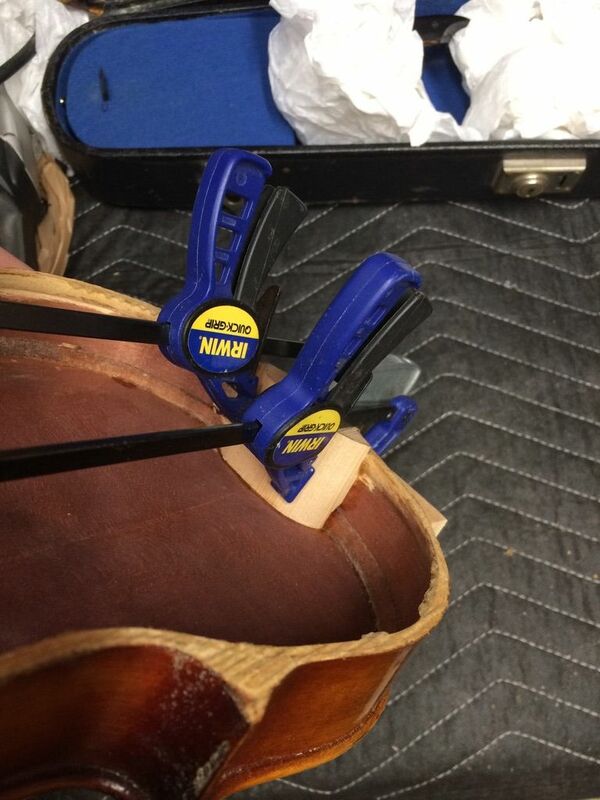 It has to all be correct when the clamps come off. 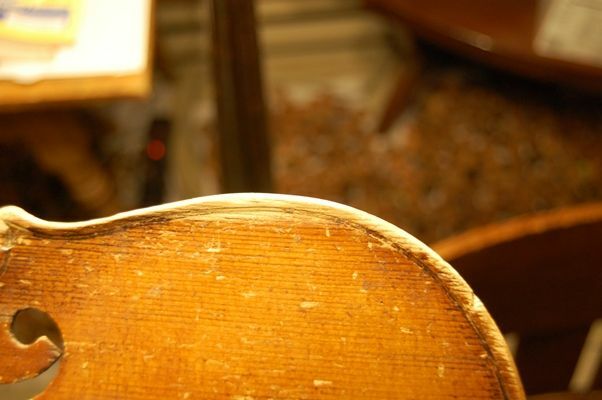 In this view you can see that all the old scuffs are still there. 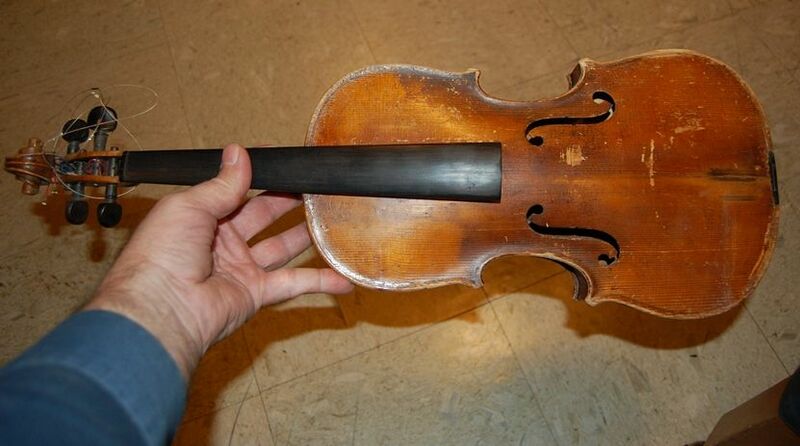 They will still have to be re-touched. 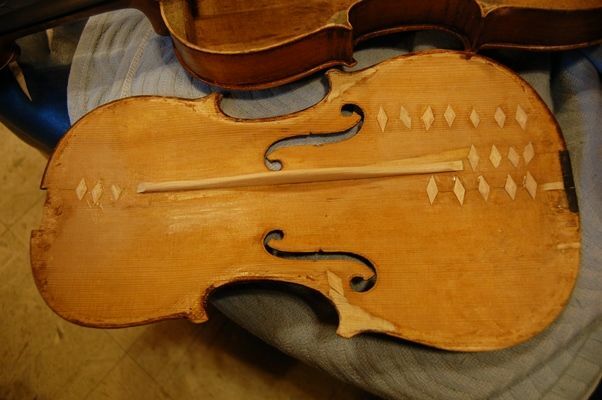 So, I have to file and smooth the neck-heel joint, then re-touch the varnish so that the old and new are a close match, at the heel and both ribs. 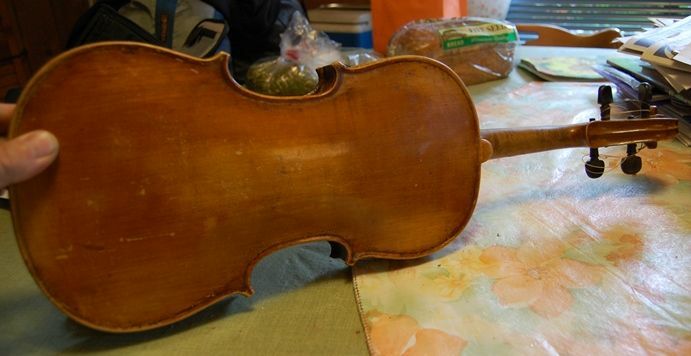 Then re-touch all the varnish, not attempting to make it new, but to cover any bare or damaged wood with varnish that matches the original varnish. The rib-patch is not invisible, but it is no longer objectionable, so I am satisfied. And finally, everything is done! 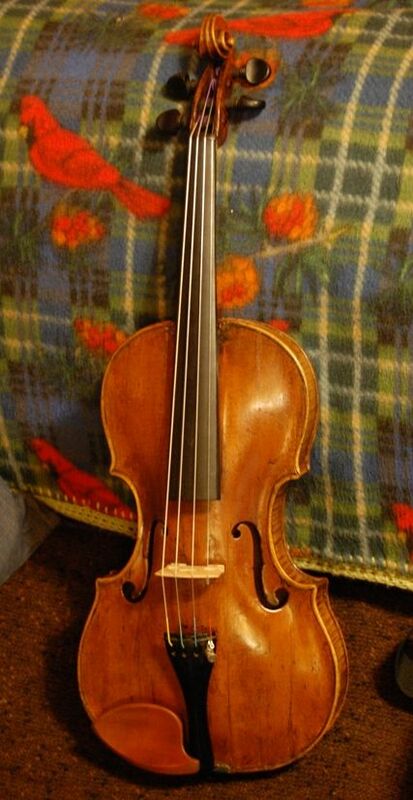 The set-up is complete, all the old dings and scuffs have been retouched, and the old fiddle looks and sounds great. Time for this one to go home.